You are currently browsing the tag archive for the ‘wedding’ tag. Well, not quite stars, but as close as one can get without being under the heavens themselves. A perfect wedding tent, pasha-like with tulle and sparkling, twinkling lights, under which to celebrate. 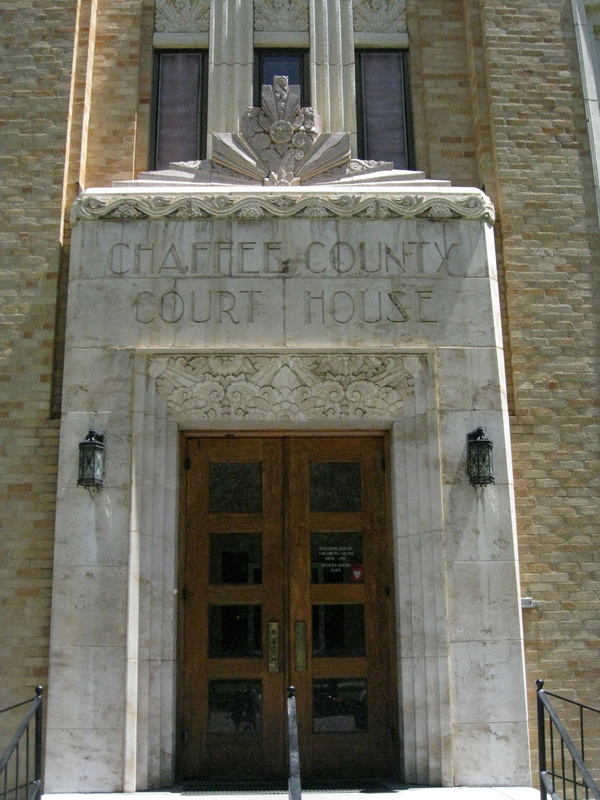 The lovely Art Deco courthouse, designed by architect Walter DeMordaunt and opened in 1932, is located in Salida, Colorado, and serves as the county seat of Chaffee County…..and the site of MKL’s and my civil ceremony. With our mutual passion for times past, fine architecture, and romance, as well as our love for Buena Vista and Colorado’s beautiful Banana Belt, it seemed most fitting, and it was perfect. Our open house the day before the wedding had the beach house bursting with friends (who are family), blood kin, and love. And the shark tacos were a hit. At the end of that party, the rainy skies cleared to a beautiful sunset and a wide calm beach, and we all migrated to the water’s edge to walk, talk, take pictures, and play ultimate. No one was eaten by sharks (the shark tacos made it the reverse) and the post-wedding day stingray stab on LJRH’s daughter was dramatic, but not debilitating, making for an excellent story for her to take back to Missouri. My loved ones made the house and the deck (E-bro’s, rented down the beach, with more room than mine) look spectacular, and perfect for an inside (rainy) or an outside (sunny) wedding. The sun cooperated and we were outside. An arc of rainbow appeared behind us as we were sitting together after the ceremony. God and my parents were smiling down on us. Painkillers – the drink of the Soggy Dollar Bar, courtesy of my much loved friends Dave and Amanda, who are my family met at that spot 11 years ago – flowed like the sea. The two small and gorgeous girls became fast and immediate friends. In fact, all the people, many of whom had never met, became friends. Beth K., the daughter of my late parents’ best friends, and a true and beautiful warrioress, joined us. We had never met before, and now I feel I have another sister. My three new stepsons, all of whom are treasures: one was the most perfect ceremony officiate ever, one steamed and bustled me and made sure I looked perfect, and one led the toasts that brought me to tears. My brother and sister-in-law and their wonderful children opening their hearts and home to us. My sister and niece flying quickly and crazily in from Colorado to share the day and capture it in photographs. Having my uncle and aunt and darling cousin (now one of my best friends, after a gap in time of some 35 years) made me feel like my parents were there. Our across-the-street neighbor who lovingly provided a sandcastle cake, delicious crab dip, serving trays, a steamer, and her and her husband’s warmth, affection, and light to our special days. JJ, who continues to allow me to come “home” every year for a few brief weeks, to the house on Topsail Beach. My stepson T’s toast, which touched me deeper than my heart. Having the Swine Sisters – aka my two best girlfriends from when I was 17 – reunited again as if no time had passed. The girlie-hen-party that was a part of my getting dressed for the ceremony. I really feel like I have lots of sisters now. I sparkled. And I glowed. And my dress was awesome. Wearing my mother’s rhinestones that I used to play dress-up in, and carrying my father’s handkerchief. MKL’s shirt matching the sky, and being my “something blue”. 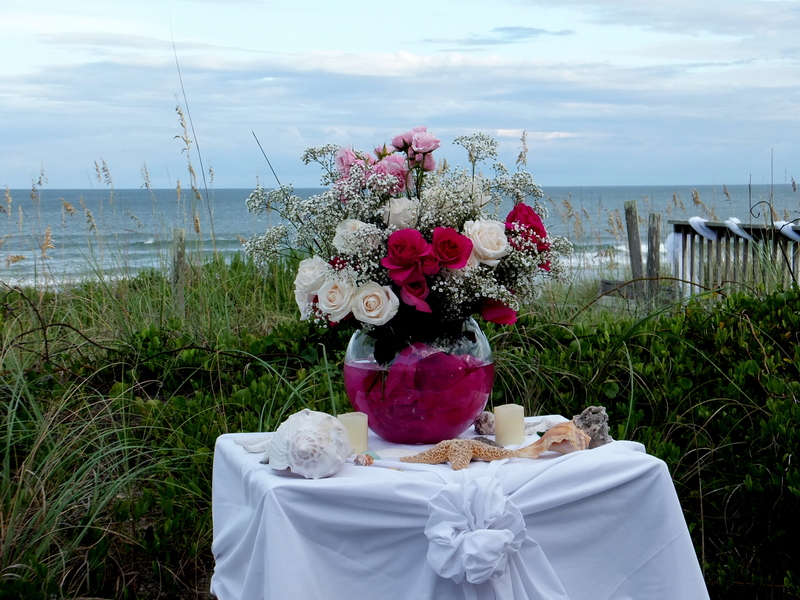 Beautiful bouquets from Surf City Florist, and a lovely centerpiece created from grocery-store bought flowers. And my daughter’s swagging and shell-arranging skills were front and center. My most darling daughter, who not only wore a dress for the occasion, but looked gorgeous, and bailed me out when I pulled her aside just after the ceremony had started and told her I had forgotten MKL’s ring and she needed to drive like a bat out of hell to fetch it from our house. She did so successfully, saving the day, and allowing her to maintain her dignity by not bursting into tears during my vows (which she read the next day). Seeing the Milky Way in the sky for the first time in years; it was here that my father first pointed it out and explained it to me. Remembering almost nothing about the ceremony but the look in MKL’s eyes, which as always looked sparkling like the sea, with a hint of aspen trees. Today is Elephant Appreciation Day, National White Chocolate Day, and the International Day of Radiant Peace. It is also my 19th wedding anniversary. Such a bittersweet day. I am still married, so it still counts. I doubt Pat remembers – he usually forgets. Last year, he was in China (he’s back now from his trip – got back on Saturday.) His not remembering is likely a small mercy. In the last few years, we would take a little weekend anniversary trip, driving somewhere in Colorado – Leadville, Canon City, Pueblo (three years for the Chile Festival – the last year, we took Kelsea.) But other than those trips, I don’t remember celebrating our anniversary often. I haven’t told any of my parents’ friends who still think of me about what’s going on. One who has known me since birth, and who is a devout born-again Christian, sends us a religious card every year to mark our anniversary. It came in the mail last week. I feel compelled to tell my “Aunt” Florence about it – she would spread the word as appropriate to the others of their set. I think she would understand. As would my Uncle George (my real uncle). I think one of his children has experienced similar problems, even if they didn’t result in divorce. I also got a lovely little note today from Swinette, with whom I had a long talk on Sunday. I thank her for her love and encouraging words, and for thinking of me. Our talk made me realize again that we are all always every age. This has been a month for anniversaries of various natures: 9/11, my Mother’s birthday, Kathy’s birthday, first day of fall, this anniversary – I am sure there are more I’m not mentioning. I’m glad we essentially started the month in Montana – that was such a wonderful journey. Kelsea’s and my annual mother/daughter Labor Day weekend trip is fast becoming a favorite tradition. Yes, it’s an odd day. I remember waking up 19 years ago, and not wanting to open my eyes because I was afraid the weather was going to be bad. But it was a perfectly beautiful day, unlike today, when it is cold, with winter storm warnings in the mountains. I remember my primal scream as Lynne drove me up the mountain, my perfect dress, the eagle flying overhead, the couple on the neighboring peak singing a cappella to us so beautifully, CJ palming the judge’s fee into his hand like it was a drug deal, the champagne and croissants that David had set up for us in the pine trees, Kenny’s photographs (he is dead now), climbing over the rocks to pee and trying to negotiate all those yards of chiffon without peeing on myself or falling down the mountain, how we both choked up, the old/new/borrowed/blue/sixpence (penny) in the shoe, how my family – who weren’t present – wore the boutonnieres I sent them, per instructions, at the same time we were having the ceremony (my grandmother loved that, and my E-Bro wore his while changing the oil in his car) – yellow roses and daisies. I remember how warm the sun and my future felt. Maybe, someday, it will again.